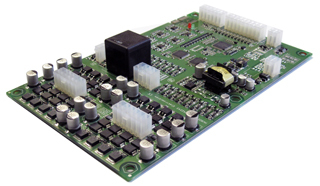 The HVS card is a microprocessor aided electronic system designed to control hydraulic proportional valves, with single or double solenoid, on/off directional valves, dump valves in hydraulic systems. The system can be used to control up to 8 valves according to the current or voltage supplied; valves can be controlled by analogue signals or On/Off signals. One auxiliary output can be used to enable On/Off operation of the dump valve or compressor bypass valve to dump the oil pressure in the hydraulic system or can be configured as pwm control. Min and max current and time to reach the desired value (ramp) can be configured for each valve. For double effect valves, parameters can be set separately for each effect, or the values set for side A can be repeated for side B of the valve. Typical applications include hydralic options in a lift truck like lifting, tilting, reaching, optional and power steering functions. The HVS card controls all hydraulic valves and can control the speed of a pump motor in addition to other functions, with fully configurable options. .Diagnosis by EasyTest PC software by USB2006 or USB-R2 serial interface.